This well known fairy tale has thousands of variants around the world and dates back to at least 7 B.C. The common theme, made famous by the brothers Grimm in their folk tale collection, “Grimms’ Fairy Tales” and by Walt Disney, is about a young woman who lived in unfortunate circumstances until her life was wonderfully changed and everything turned around. The title of the story and her name is changed in different languages, but the common theme is about someone whose qualities and attributes were unrecognized, about someone who was exploited and treated unfairly in years of obscurity and neglect whilst being treated like a lowly servant girl, until she was rescued and elevated to royal status. Walt Disney made a wonderful series of movies like Snow White, Bambi and Cinderella, when our central figures sang, danced and talked with the animals as birds and butterflies fluttered around them singing along or chirping merrily in accompaniment. Remember those good days? I miss them. I can remember the days when we could leave our homes open, go shopping and not have to lock up. If we forgot to and even left the keys in the car, nothing was touched. I can remember when we went to the movies and booed and hissed at the villains and cheered our heroes as they triumphed over evil. Those were the days! Men were men and men were gentlemen too! Women were feminine and the respect and courtesy people often shared with each other was admirable. One could almost say that we all behaved like Christians (should)! Cinderella is the beloved child of a widowed gentleman, a kind and devoted father who feels as though his daughter needs a mother's care. He marries Lady Tremaine, a widow with two daughters of her own: Drizella and Anastasia. After Cinderella's father dies unexpectedly, Lady Tremaine is revealed to be a cruel and selfish woman, only interested in her daughters. Cinderella is humiliated and mistreated by her stepfamily, who take over the estate and ultimately reduce her to being a scullery maid in her own home, one step short of being held prisoner. Despite this, Cinderella grows into a kind and gentle young woman, befriending the mice and birds who live around the chateau. 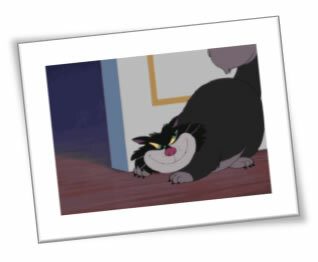 One day, while Cinderella is preparing breakfast, Lady Tremaine's cat Lucifer chases Gus, one of the mice, into the kitchen. Cinderella delivers breakfast to her stepmother and stepsisters, unaware that Gus is hiding under Anastasia's teacup. This makes Anastasia so angry that she tells her mother of the apparent prank, and Cinderella is punished with extra chores. Meanwhile, at the royal palace, the King discusses with the Grand Duke his desire for his son the Prince to settle down and have children. They organize a ball in an effort to find a suitable wife for the Prince. Cinderella asks her stepmother if she can attend, as the invitation says "every eligible maiden" is to attend. Lady Tremaine agrees, provided that Cinderella finishes her chores and finds a nice dress to wear. Cinderella's animal friends, led by Jaq, Gus and the other mice, fix up a gown that belonged to Cinderella's mother using beads and a sash thrown out by Drizella and Anastasia, respectively. When Cinderella comes down wearing her new dress, Lady Tremaine compliments the gown, pointing out the beads and the sash. Angered by the apparent theft of their discarded items, the two stepsisters tear the dress to shreds. Just as Cinderella is about to give up hope, her Fairy Godmother appears and turns the remains of Cinderella's dress with her magic wand into a white ball gown and gives her glass slippers. She also transforms a pumpkin into a carriage, the mice into horses, her horse Major into a coachman, and her dog Bruno into a footman. The Fairy Godmother warns her the spell will break at the stroke of midnight. 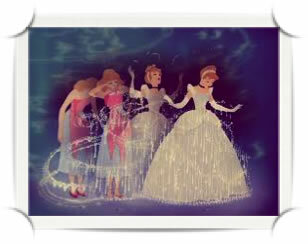 At the ball, the Prince rejects every girl until he sees Cinderella. The two fall in love and dance alone throughout the castle grounds until the clock starts to chime midnight. Cinderella flees to her coach and away from the castle, losing one of her glass slippers in the process. After her gown turns back into rags, the mice point out that the other slipper is still on her foot. The Grand Duke informs the King of Cinderella's escape and presents the slipper as their only piece of evidence. The King orders the Grand Duke to visit every house in the kingdom to find Cinderella, issuing a royal proclamation that she will then marry the Prince. When news reaches Cinderella's household, her stepfamily prepare for the Duke's arrival. Overhearing this, Cinderella dreamingly hums the waltz played at the ball. Realizing Cinderella was the girl who danced with the Prince, Lady Tremaine locks her in the attic. When the Duke arrives, Jaq and Gus steal the key to Cinderella's room, but Lucifer ambushes them before they can free her. With the help of the other animals and Bruno, they chase him out of the house and Cinderella is freed. As the Duke prepares to leave after the stepsisters have tried to force their enormous feet into the slipper, Cinderella appears and requests to try it on. Knowing the slipper will fit, Lady Tremaine trips the footman, causing him to drop the slipper, which shatters on the floor. Cinderella then produces the other glass slipper, much to her stepmother's horror. A delighted Duke slides the slipper onto her foot, and it fits perfectly. Cinderella and the Prince celebrate their wedding and live happily ever after. I shared this to illustrate that her story may be likened to ours in some ways. 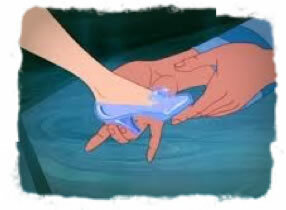 To a certain extent we were all like Cinderella—alone, lost, forsaken, treated poorly or even abused in many ways. They can range from being unequally yoked in marriage, subject to sibling rivalry, lied to or about, subjected to fierce competition in business, cheated from an inheritance, stolen from and so on. Does anything sound slightly familiar? Cinderella was in a predicament, not by anything that she had done, but because of the actions of others. It was not her “fault” that her mother died. It was not her “fault” that her father remarried, or that he passed away leaving her alone without her own father and natural mother. It’s not our fault that you and I were once here...lost worse than a goose in a fog and destined for the pit until a Prince Charming saw us and came to our rescue. If you look at Romans chapter five, you can see that someone else’s actions had an adverse result in our lives. What you and I do or neglect to do can have a rippling affect that can be good or not on others for years to come. It behooves to ensure that our conduct, even what we say, is always good, positive, faithful and Godly. We can’t help what others do or say, but we can control our own lives to make sure we do not leave a legacy that hurts others down the line somewhere. Cinderella’s father could have correctly wanted to find a mother for his daughter and of course another companion in life—that’s acceptable, but it may also unwittingly introduce another problem. There is no deeper bond than the bloodline. No matter how loving and caring anyone can be, your own offspring is of your own bloodline and the bloodline does not exist if children by another step-parent come along. Similarly, adoption lacks that tie. Step children are different to natural children, no matter what, and sibling rivalry that exists in ordinary families can be worse in a second marriage. Our blessing is that we have not just been adopted into the family of God, we have been brought in through the blood. We have been made to be the very sons (no gender) of God, not just “adopted”. It is because of a blood transfer. It is as if Jesus’ blood is now flowing through your veins and my veins. That might sound a little strange perhaps, but I say this to illustrate how much we have been taken into the bosom of our Father, made to be as one because of Jesus. Check what Jesus said in John, especially chapters 14 to 17 where He said that we are all designed to be one and that God lives in us and we in God. He said that He is the vine and we are the branches. If this is true, then we have the same sap flowing through us. That “sap” did not exist in Cinderella’s stepmother. There was no blood tie with her and the stepsisters were just that...stepsisters. We are not stepsons of God but sons of God (no gender)! As sons of God, we are His heirs! In fact, we are co-heirs with Jesus. Over the past few weeks, the Lord has been speaking volumes to me about our position in Him and with Him and it can rattle religious cages. We do not know the half of what He has done for us and what he is doing for us. I will be sharing some of this with you shortly. Sibling rivalry also exists in natural born families. Your own brother or sister could behave as if they were your enemy and do not be surprised at that. Jesus said in Matthew 10 not to think that He was going to bring peace. He said that He came with a sword. ... who will acknowledge Me before men, I will also acknowledge him before My Father in heaven. But whoever denies Me before men, I will also deny him before My Father in heaven. Don’t assume that I came to bring peace on the earth. I did not come to bring peace, but a sword. For I came to turn a man against his father, a daughter against her mother, a daughter-in-law against her mother-in-law; and a man’s enemies will be the members of his household. And whoever doesn’t take up his cross and follow Me is not worthy of Me. Don’t think it is not real...it is! The qualifier is who we relate to most. It is Jesus or not? He is not telling us to abandon our flesh and blood. He is telling us that the love relationship and loyalty has to put Him first. See 1 Timothy 5:8. Micah 7:5-6 is also powerful. Don’t trust anyone— not your best friend or even your wife! For the son despises his father. The daughter defies her mother. The daughter-in-law defies her mother-in-law. Your enemies are right in your own household! I was preparing some notes for a bible study many years ago and was using a printer that someone gave me. They said that if I could get it working, I could have it and I got it working. I copied some bible verses off my bible software that I had then and pasted them into a word document and hit the print command, when the printer took off. It started printing out these verses and kept going, page after page after page and no matter what I did, the printer would not stop! Part of the printout included Micah 7, but I had not chosen that! It was the only time I used it. The printer did not work again after that. I learned much about loyalties from that exercise. God is very serous about our relationship with Him. I said that to say this: Sometimes our own family members can be instruments knowingly or unknowingly to try to sink our boat. I know I am talking to someone here. You might be “a Joseph”. You have a heart to serve the Lord and have made attempts to launch out into the deep, but have been opposed. Such opposition can even have come or still be coming from people close to you and it is hurting and confusing you. They could be treating you like a “Cinderella”. Have I painted a picture? We could all identify to some extent here of course, but I am addressing a specific area here. The Lord knows all and is working on things on your behalf. You could feel like this little damsel, who wept in solitude, but she was being watched without knowing it. Her fairy godmother saw it all and rescued her. The Lord watches over us too. I will praise you, Lord, for you have saved me from my enemies. You refuse to let them triumph over me. O Lord my God, I pleaded with you, and you gave me my health again. You brought me back from the brink of the grave, from death itself, and here I am alive! We do not have a good fairy godmother, but we do have a Great Daddy in Heaven who is working on something on our behalf. He was working on a plan in Joseph’s life too and you know the story. He was abused by his own brethren. He was sold into slavery, lied about by Mrs Potiphar, thrown into jail and forgotten even when he blessed a prominent man, but all this was part of God’s plan. Joseph went through all that so that he could become the most powerful man in the land, next to the king. A “Joseph” goes through much, is sometimes pushed around by many people and is often the subject of sibling rivalry. Jealousy often reigns and quite often a “Joseph” will seem to be an outcast even in his own family. He will be tricked, used like a servant, spat on, ridiculed and so on. It is like the treatment Cinderella received until the tables were turned and she was more than vindicated. She was promoted in life whilst those previously against here were brought low. When she was last, she became first. Jesus said that the first shall be last and the last shall be first. Consider Moses also. He was “cast out” as a child, then cast out from the only home he knew, but led a nation into liberty. You, my friend, could be a “Joseph” or a “Moses” or even a “Cinderella”, but I have news for you. The end is better than the beginning. Just when she was about to give up in despair, someone rescued her. You could be on the verge of despair and giving up hope, but God is working on a plan, to a timetable and is moving things around; positioning things here; re-positioning things there and is getting the help and support you need ready. That glass slipper was made especially for her and no one else could wear it. What God is preparing for you is custom made just for you and no one else. No other person can walk the walk God has for you. When she wore that slipper, her whole walk in life changed. Her prince charming searched for her to place the one he had on her foot. Your Prince charming is also looking for you and He too has a special slipper just for you. It will change your very way of life. Be open to Him and respond to Him and you will never be the same again. You will walk differently, talk differently and probably even look different!